Sterling Silver Interlaced Celtic Heart comfort fit wedding band ring in 6.5mm width. 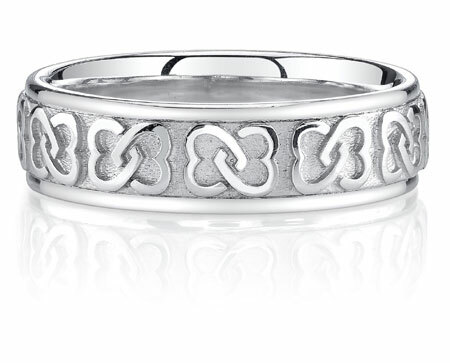 This Interlaced Celtic Heart Knot Wedding Band Ring in Sterling Silver is the perfect way to celebrate that you and the one you love are linked together for life. This unique wedding ring uses both a timeless symbol of love and a design that many have adopted as a symbol of eternity to create a look that captures the beauty of two hearts that are inextricably intertwined. At first glance the motif that's repeated around this silver wedding band might look like a Celtic inspired design; while this is an accurate description, it's not the whole picture. This design is actually comprised of two hearts, one lying on its left and one lying on its right, that interlock in the center like a pair of butterfly wings. This raised pattern provides a unique and graceful take on the classic emblem of love, integrating elements of Celtic style and rendering this symbol fresh and new. The brushed backdrop of this ring allows the gleaming hearts as well as the polished edges to readily capture eyes. Crafted from the highest quality of silver that can be used in wedding bands, .925 sterling silver, this ring is an affordable and beautiful celebration of your unbreakable connection with the one you love. We guarantee our Interlaced Celtic Heart Knot Wedding Band Ring, Sterling Silver to be high quality, authentic jewelry, as described above.